Mort Künstler Hand Signed and Numbered Limited Edition Canvas Giclee:"Use the Whole Damn Fleet, But Save Ensign Thompson…"
Edition Size: Artist Hand Signed and Numbered Limited Edition to 100 with COA. 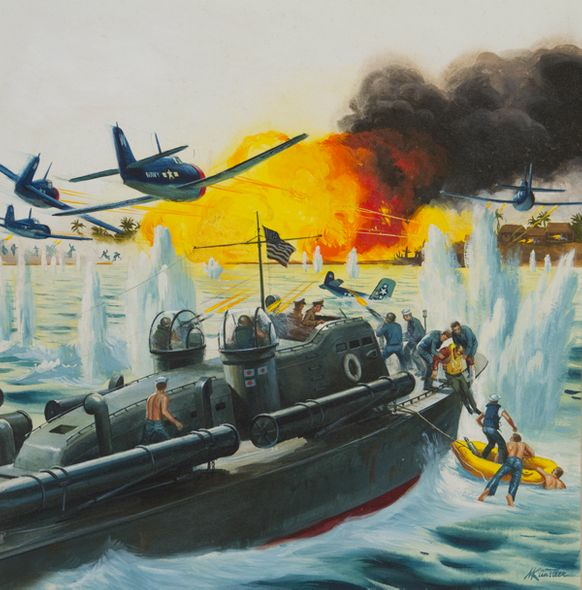 About the Art: On September 16, 1944, Lieutenant Arthur Murray Preston volunteered to lead a rescue mission of downed Navy Hellcat pilot, Ensign Harold A. Thompson. Preston commanded two PT boats through sixty miles of heavily mined waters in Wasile Bay, Halmahera Island in Indonesia. Under continuous Japanese fire for 2-1/2 hours, Preston was successful in what was considered a suicidal mission. Preston was subsequently promoted to lieutenant commander and awarded the Congressional Medal of Honor.